I am SO freaking excited to share this recipe with you today. I feel so proud because the recipe comes from my dear friend Amanda’s new cookbook, Latin American Paleo Cooking. Amanda, author of the site, The Curious Coconut, and I have been friends for a long time and I have watched her grow so much in the time I’ve known her. Now she’s gone and written a best-selling cookbook. I got to see a little sneak peek of this book back in February and I was SO excited for its release. I am beyond honored that Amanda asked me to write an endorsement for it, so even though I didn’t write the cookbook, my name is there on the back cover of a best-selling book. Umm, wow! And then, as I was writing this blog post, I just happened to glance at the Acknowledgements section and saw that Amanda mentioned me there. I started crying. The love and gratitude for our friendship is beyond words. Now, let’s dive into this incredible book! I love Latin food, but the thought of cooking it myself, at home, always seemed overwhelming. There were always ingredients that I was not familiar with and the recipes always seemed super complex. So, Tex-Mex it was. That’s about as “authentic” as I would get. NOW I can cook all the amazing Latin American cuisine I want with Amanda’s new book. She has taken what seemed like an intimidating style of food and made it easy and accessible for the average person. And even better, the whole book is dairy and gluten free (yay for me!) and most of the recipes are either already AIP-friendly or can easily be adapted to be AIP-compliant. This book really is a win, win, win for anyone who is needing to avoid common allergens but still wants great tasting food. The recipes are super bold, flavorful, and exciting to the taste buds. The recipes are not nearly as intimidating as I expected, with many of them being downright simple. And, lastly, because this book was a joint venture with Amanda’s beloved mother-in-law, Milagros Torres, you get a sneak peek into their Latin heritage and the emotion and history behind the recipes. 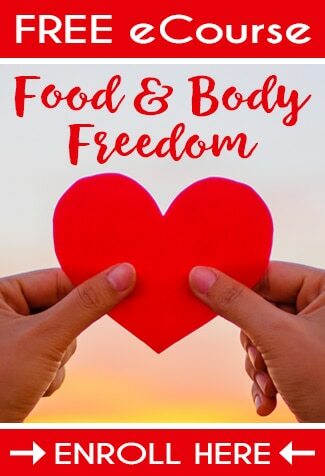 You feel like you are be invited into their home and culture, allowing you to see why these amazing dishes of food are such an integral part of their lives. OK, there’s one other thing I want to say about this bool before we dive into today’s recipe. It’s not often that I would recommend buying a cookbook for one single recipe, but yeah. Today is that day. A few days ago, I made the “queso” blanco from the book. It’s completely dairy-free and INSANELY delicious. I have tried A LOT of non-dairy cheeses (since dairy and I are just not good friends) and they are all honestly less than stellar. But Amanda’s recipe? I was gobbling it down before it even cooled. I was gobbling it down before it even cooled. It tasted just like melted white cheddar and the texture? SPOT ON. When it cools down it has the consistency of fresh mozzarella (and it melts like it too). Pizza time anyone? Yeah. Let’s roll! YOU GUYS!!! It’s not often that I would recommend buying a cookbook for one single recipe, but yeah. Today is that day. I just made the “queso” blanco from @thecuriouscoconut’s Latin American #Paleo Cooking. Completely #dairyfree and INSANELY delicious. ???? I have tried A LOT of non-dairy cheeses and they are all honestly less than stellar. But this one? I was gobbling it down before it even cooled. It tasted just like melted white cheddar and the texture? SPOT ON. When it cools down it is supposed to have the consistency of fresh mozzarella (and is supposed to melt) like it too). I’m not sure if there will be any left though. I can’t stop eating it! Pizza time anyone? Yeah. Let’s go! ???? Check her book out on Amazon here: http://amzn.to/2kyS0tt (clickable link in profile). I promise you, you won’t regret it. And make sure you check out the blog on Tuesday — I’ll be sharing a tasty recipe from the book. Amanda was so kind and let me choose what recipe I wanted to share here on the blog, and let me tell you, this. was. HARD. This book is filled with 80+ recipes that all look and sound amazing. Picking just one to share was a challenge, but I decided to go with the Aranitas de Platanos and then she allowed a bonus second recipe for the amazing Guasacaca Dipping Sauce. Because, come on, delicious fritters need to be dunked in a delicious sauce. Aranitas means “little spiders” and when you see the spindly “legs” that emerge from the shredded plantains as you fry them you’ll see why they were given this name. This is a crazy easy and delicious recipe and your kids are going to LOVE them! 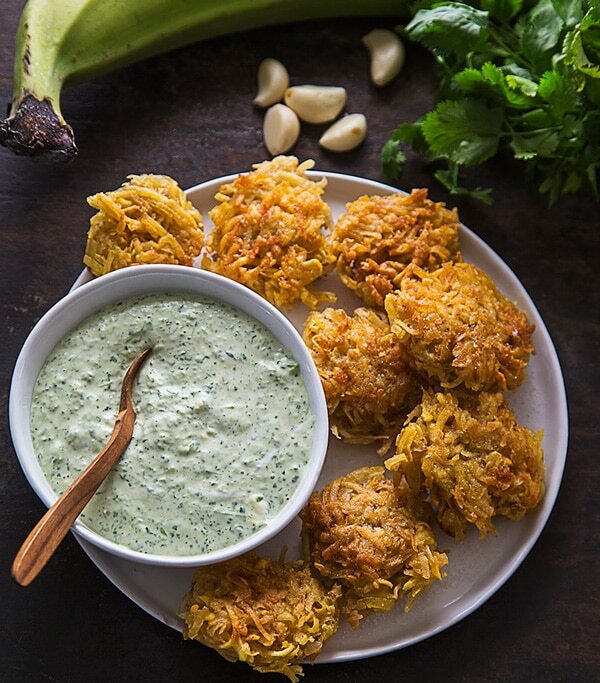 The fritters themselves are simply seasoned with salt, allowing you to dip them into your favorite sauce of choice (they could easily go sweet or savory). I chose to share the Guasacaca Dipping Sauce alongside these “spiders” because it combines a few of my favorite ingredients: avocados, cilantro, and lime. This super creamy dipping sauce has quickly become a favorite here. You can make it chunky or smooth, though I prefer it to be smooth. I have also found that it can be used for more than just dipping too. Try it on salads, sandwiches, or even over chicken, fish, or steak. These will quickly become one of your favorite go-to snacks for the whole family. Before we dive into the recipes, I want to share a little more about the book and why this is such a fun addition to any real food kitchen. 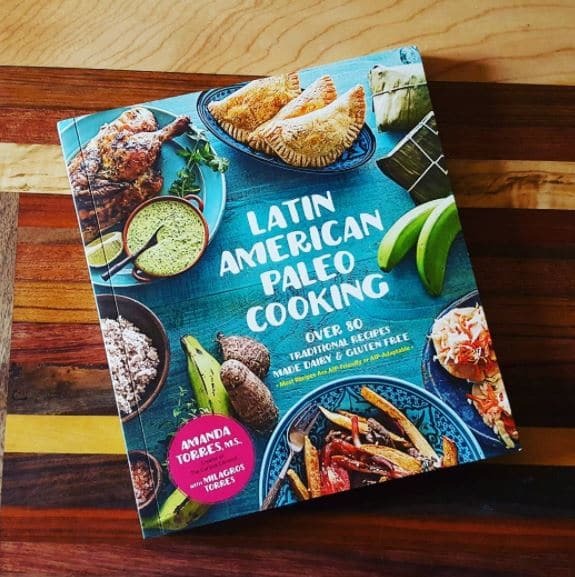 Here are some of the most commonly asked questions about Latin American Paleo Cooking so that you know exactly what to expect. Puerto Rican, Cuban, Colombian, Venezuelan, Peruvian, Salvadoran, Argentinian, Brazilian, and Dominican. All recipes are traditional recipes adapted to be made with Paleo and AIP ingredients. Amanda took extreme care to make every dish as absolutely authentic as possible, while still adhering to Paleo and AIP requirements. Over 90% of the recipes are AIP or easily adaptable, without sacrificing authenticity. Are These Recipes Full of Nightshades? While it is true that some Latin dishes prominently feature nightshades (potatoes, tomatoes, and peppers), many dishes do not. Amanda used her amazing kitchen wizardry to come up with alternatives to nightshades you may not even realize are replacing the peppers and tomatoes. There are 81 uniquely delicious recipes with zero boring fluff or filler recipes! Recipe sections include Family Dinners, Quick and Easy, Party Food, Sides, The Essentials (sauces, cooking bases, etc. ), and a few authentic desserts. Do I Need Any Fancy Flours or Cooking Oils? Nope! The only flours used in this book are tapioca starch (or arrowroot), coconut flour, and cassava flour. Many recipes actually use fruits and vegetables like plantains and yuca to create doughs. Most of the recipes are flexible when it comes to fats and oils letting you use the one(s) that you already have on hand. What About Other Crazy Ingredients? Amanda really did her best to keep her recipes authentic and accessible to everyone, no matter where you live. For some of the recipes, you will need to find a few pieces of produce that, depending on where you live, your regular grocery store may not carry, like plantains, yuca, malanga, culantro (different from cilantro), and chayotes. The good news is that many grocery stores catering to any kind of international customers will generally carry a wide range of “exotic” produce, and almost every city is going to have a Latin market in town where you can easily locate the items your normal grocery store may not have. There are a few recipes that call for specific types of chile pepper pastes for the most authentic flavor. You can easily purchase these online (like this organic version on Amazon) or may be able to find them at your local Latin grocery. For our AIP peeps, Amanda has provided non-nightshade alternatives. You can get an amazing sneak peek at the book on Amazon here where you can see the full table of contents and a bunch of the amazing recipe photos. If you want to add a copy of this amazing cookbook to your library, you can order it here. Arañitas means “little spiders.” When you see all the spindly little “legs” that the plantain shreds form once you fry this dish, you will see why they were given such a name. Rather than adding seasoning to the fritters themselves, they are best dipped in your favorite flavorful sauce from the final chapter, “Los Esenciales.” Guasacaca is an avocado-based sauce that is similar to guacamole and can be made either chunky or blended to be smooth, depending on your preference. I like to blend it into a smooth texture. Using a large Florida-type avocado makes a lighter, smoother texture, but you can also use Hass avocados. Peel the plantains by slicing off both tips with a knife, then cut 1 or 2 slits in the skin down the length of the plantain. If the peel does not lift off easily, you can soak the plantains in a bowl covered with water and with about 1 teaspoon (6 g) of salt for 10 to 15 minutes to loosen the skin. Use the large side of a box grater to shred the plantain. You can angle the plantain to create longer shreds, if desired. Do not use the fine grater or the texture will not be correct. In a small or medium skillet, heat your fat of choice over medium heat for 3 to 5 minutes. The deeper the level of fat in your pan, the “fluffier” your arañitas will be. Using less fat results in flatter arañitas. Divide the plantain shreds into 12 equal portions, shaping each portion into a ball between your hands and gently flattening before dropping them in the heated fat. Cook them for 3 to 4 minutes per side, or until golden and crispy. 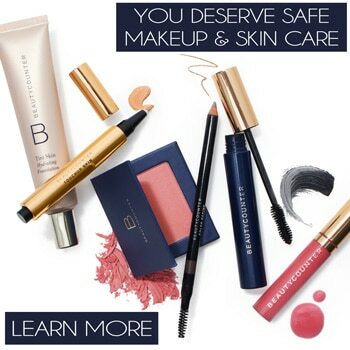 Work in batches as necessary. Transfer to a paper towel-lined plate. Sprinkle with salt to taste and serve with your favorite dipping sauce, such as the Salsa Verde Magica (page 165), Ajilimojili Sauce (page 151) or Guasacaca (page 166 in book or recipe below). In a food processor or blender, puree all the ingredients into a smooth sauce. Serve with Tostones (page 115), as a condiment with arepas (page 67 or 68), slathered on a Patacon Maracucho (page 72), or with the plantain "spiders" above. AIP compliant: Omit the black pepper and peppers for a flavorful avocado sauce.